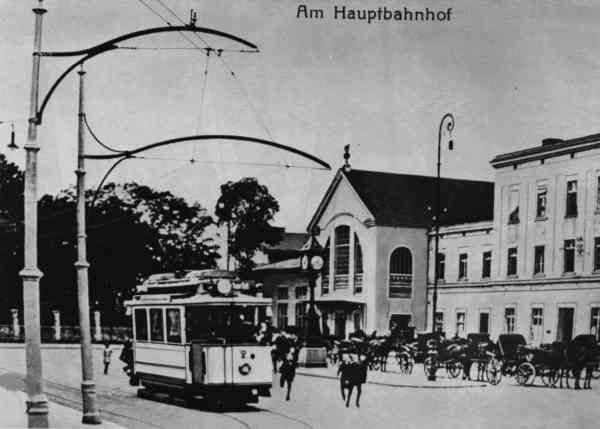 Despite crucial advancements of the trolleybus the Eberswalder aldermen gave on 10 August 1909 their preference for the construction of an electrical tramcar operation. Decisive among other things were also the mostly good results of the streetcar operation in other cities. The concession for the Eberswalde tram was given on 31 March 1910. The Berlin Siemens Schuckert factories received the job for the building of the Eberswalde tram. This contained the building of the distance and the electrical equipment of three two-axle tramcars produced by the Waggonfabrik Gottfried Lindner AG Ammendorf/Germany. The depot and the substation were built in the Bergerstraße on the area of the urban operations. The public utility had planned and built the depot with workshop, tool-storage room, a blacksmith's shop, a lounge for the repair crew and a toilet. In the depot were place for six cars. Via the Zimmerstraße the depot could be achieved. The current supply of the tram was implemented by the urban power station, which likewise was in the Bergerstraße. Later the urban power station became attached to the Märkische Elektrizitätswerke, a interurban power station. The Märkische Elektrizitätswerke was situated at the Finowkanal in Heegermühle (today: Finow). 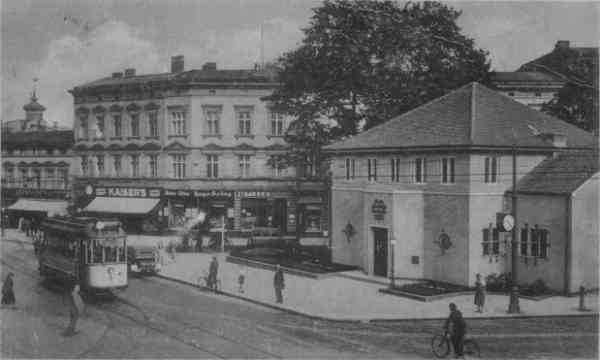 The substation for the tram was supplied by the AEG-Allgemeine Electricitäts-Gesellschaft Berlin. In this transformer system three phase ac motors, which were coupled with a direct current generator by 50 KW performance and an output voltage by 550 V, produced the direct current for the tram. At the end of May 1910 began that the building of the tramway in the rule track width of 1435 mm. 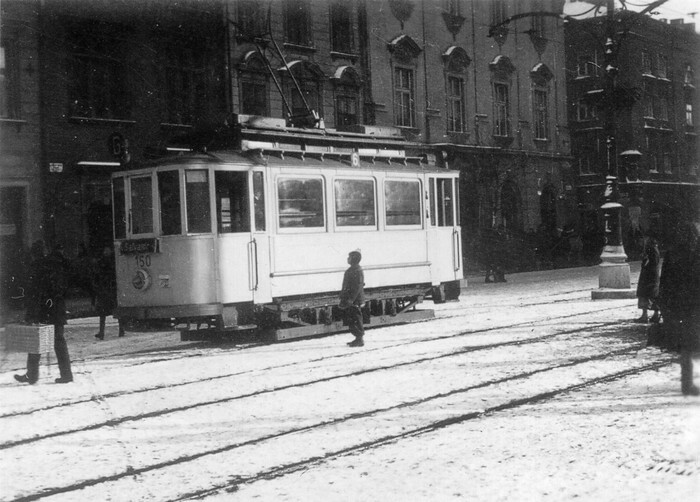 The tramway was 2.7 km long, single-lane and had a place for evasion at the Alsenplatz. At the final stops Kleinbahnhof and Markt were created the places for evasion for a later sidecar operation. After fewer than three months construction period, on 27 August 1910, the tramway from Markt to state railway station was checked with a test run by the police. On 01 September 1910 with three two-axle tramcars the operation of the Eberswalde tram between Markt and state railway station was taken up with 15 minute timetable intervals. The 1.2 km long distance to Kleinbahnhof was put into operation some days later, because the new railway bridge was not yet certified for the tram traffic. The price of transportation amounted to 10 Pfennig (German money). As a result of high ridership still 1910 two two-axle sidecars of the Waggonfabrik Gottfried Lindner AG Ammendorf/Germany were bought. One of this sidecars was converted 1916 by the Waggonfabrik Gottfried Lindner AG Ámmendorf/Germany into a tramcar (no. 4) with electric motor. Furthermore a snow plough and ever a small and large mobile ladder were procured. The photo shows the small and large mobile ladder of the Eberswalde tram. The First World War was from 1914 to 1918. Because the men were at war, starting from 1916 women were engaged as tramcar drivers and again dismissed in May 1919. Starting from 30 November 1918 coal was transported with the tramcar from the goods station to the gas works over connection rails. In the year 1920 the Waggonfabrik Gottfried Lindner AG Ammendorf/Germany supplied further five tramcars and four sidecars. Every tramcar were two-axle and already more modern type. On the 08 December 1920 the extension of the tramway was taken in operation in direction to western outskirts from Kleinbahnhof to Eisenspalterei. Then due to the prevailing inflation adjusted and on 13 April 1921 taken in operation again. In 1922 financial difficulties, caused by the inflation, made necessary the sales of the 1920 supplied five driving and four sidecar after Utrecht/Netherlands. From 22 November 1922 to 13 November 1924 the tram operation was completely stopped due to the prevailing inflation. On 14 November 1924 the operation between Kleinbahnhof and Markt was taken up again. The distance to Eisenspalterei was not no more driven on and was later dismantled. Since Eberswalde expanded also in eastern direction the tramway was extended up to the Saarstraße. 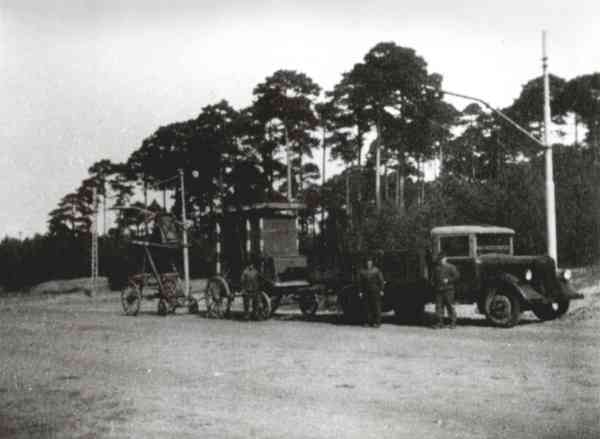 On 22 August 1927 the operation on the new section was taken up. Two tramcars were bought again by the Waggonfabrik Gottfried Lindner AG Ammendorf/Germany. After coming into power of the fascists in the year 1933 were built two barracks in Eberswalde, Freienwalder Chaussee. The Eberswalde company Ardelt-Werke manufactured with priority armaments. The armaments manufacturer Ardelt-Werke enlisted skilled workers from completely Germany. Until the year 1937 the Ardelt-settlement was developed in Ostend. Due to these factors the ridership of the Eberswalde tram rose strongly and them achieved in the long run their capacity limit. A expansion of the electrical tramcar operation or a replacement investment was needed. The trolleybus should become the replacement investment and consequently the Eberswalde tramcar operation was adjusted on 02 November 1940. This photo show the tramcar no. 2 of the Eberswalde tram at the main station. The photo show the tramcar no. 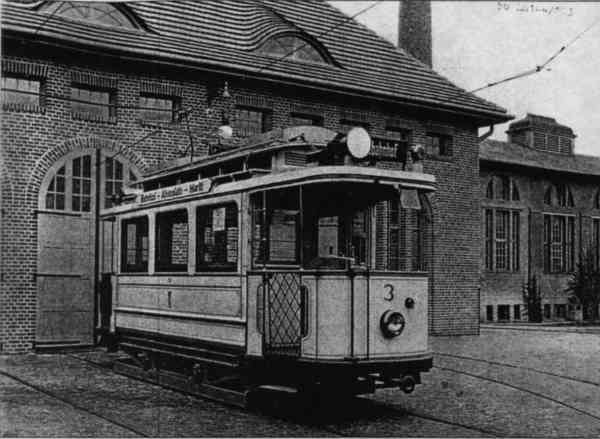 3 of the Eberswalde tram before the depot in the Bergerstraße. The photo show the tramcar no. 5 of the Eberswalde tram at the Alsen-Platz. At the bottom left in the photo one can detect the branch Zimmerstraße to the depot Bergerstraße. In the year 1941 the tramcars and sidecars of the Eberswalde tram became sold after Rostock/Germany and Krakau (today: Kraków/Poland). In Kraków/Pl the Eberswalder tramcars were used in consideration of its small capacity of transporting and its technical condition predominantly as maintenance vehicle. The photo show the former Eberswalde tramcar no. 1 with the car no. 150 in use in Kraków/Pl in the year 1941. In Kraków/Pl the former Eberswalde tramcar no. 2 was conserved. The status of the tramcar was very bad. 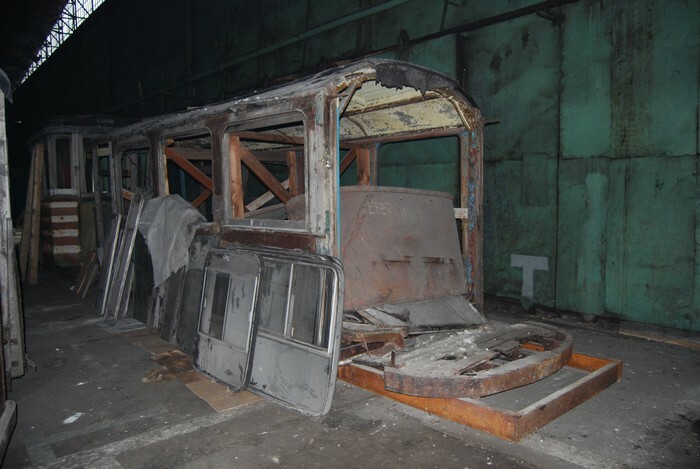 The Kraków transportation company (MPK) will reconstruct the former Eberswalde tramcar. In the year 2015 the former Eberswalde tramcar no. 2 was reconstructed by the Kraków transportation company (MPK). 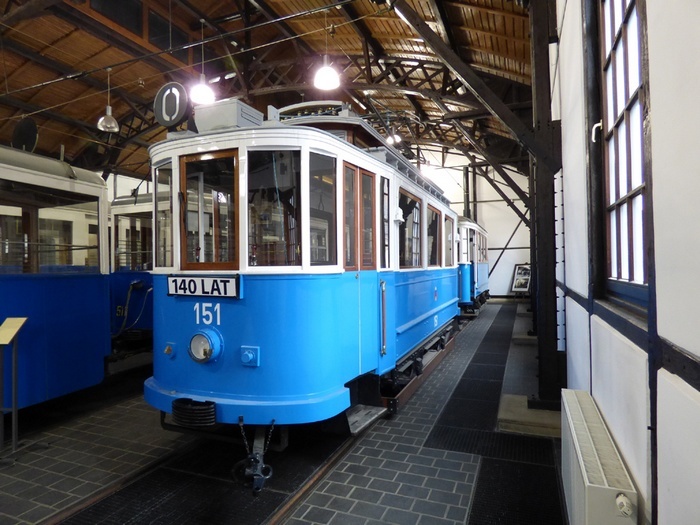 The photo shows the former Eberswalde tramcar no. 2 with the Kraków car no. 151 in the Technical Museum of Kraków/Poland in February 2016.